Is it possible to know if a point in below a direction vector or a line? I'm not good at maths and I'm having a really hard time figuring this out, I seen some answers to doing this in a 2D but can't find anything for 3D. I have a capsule that is laid horizontally and I want to know if a point is below or above a line which goes through the bottom of the capsule to the top of the capsule. I attached an image that might explain it a bit better. I have a Position Vector for the point, direction vector of the capsule, and the position vector of the capsule. and I can find the bottom and the top of the capsule if needed. Browse other questions tagged vectors 3d or ask your own question. How to find line parallel to direction vector and passing through a specific point? 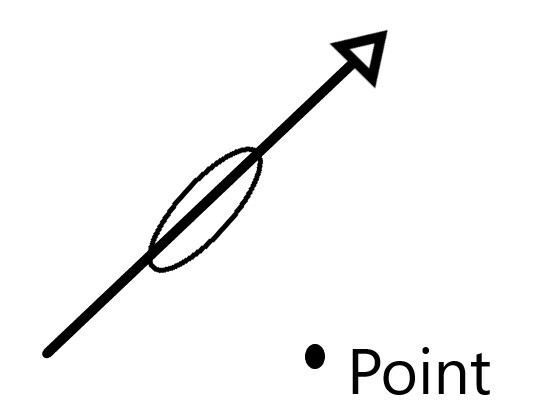 How to find a point which lies at distance d on 3D line, given a position vector and direction vector? How can I project a vector onto a plane from a particular perspective?